The same old routine got you down? Test your legs and your will against these six quad burners. Then call work to let them know you might need extra time to get out of bed tomorrow morning! Is your lower-body training a badge you wear on your sleeve and every social media account? Or is it something you tend to dial back because your knees scream like howler monkeys once you put a bar on your back? Either way, I've got options for you. Heavy lifting, high-rep work, brutal finishers—they're all here. Your excuses are about to get boiled alive in lactate. Rear-foot elevated or "Bulgarian split squats" are well-known developers of both the glutes and quads. But there are a couple of things you can tweak in this lower-body staple to make it even more effective, for the quads in particular. First of all, when performing split squats—or lunges for that matter—to maximally recruit your quads, keep your torso upright instead of allowing it to lean forward. Leaning your torso forward changes the mechanics of these lower-body exercises to focus more on your glutes and hamstrings. If you find it difficult to stay upright, that's a likely sign that your rear foot is elevated too high. Not only can this be awkward, it can put unwanted extension strain on your lower back at the vulnerable bottom of the movement. The solution is to elevate your rear foot on something that's about mid-shin height. This not only makes this exercise more comfortable and less awkward to perform, but it could also help make it generally safer. The other way to turn up the heat—and grit—on this movement is to pause at the lowest point of the movement for 8-10 seconds before you perform your first rep. 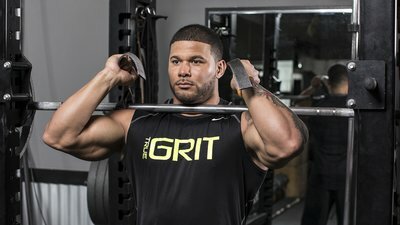 I call these "pause-go" reps, and they're great for plenty of other movement, such as push-ups, as I explained in my article "The 6 Grittiest Chest Moves You're Not Doing." With Bulgarians, they may just make your quads pray to the gods. Front squats—nothing new, right? Well, then why aren't you doing more of them? The most popular answer: They hurt your wrists. If that's the case, I've got your answer, which I explained further in my article "7 Gym Hacks You Need to Know." Just wrap a pair of wrist wraps around the bar, and hold onto the straps. In fact, do more than hold onto them: Pull up actively on them to amplify the tension throughout the upper body. These may just be the best-quality front squats you'll ever do. The other reason people give for skipping front squats: They can't match the muscle-building potential of the so-called "king of lifts," the back squat. I disagree! Research has shown that the front squat is as effective as the back squat in terms of overall muscle recruitment, and with significantly less compressive forces on the spine. The upshot: front squats provide all of the upside of other squats, but may be better for lifters with knee or back issues. I had Steve Weatherford perform front squats in the full-body hybrid conditioning video workout of the True Muscle Trainer, and trust me, at 3-4 heavy reps per set, they were every bit the match of a similar set of heavy back squats! I'm not anti-back squat by any means. They're still as great a leg builder as any other squat variation. But if you're going to perform them—and especially if you're going to perform them for quad development—then you need to approach with that priority in mind. First of all: Don't rush to go below parallel. Research demonstrates that quadriceps development is maximized by squatting parallel, with no additional quad activity occurring below that point. Those extra couple of inches is mostly driven by the glutes. Of course, many people are looking to get both their quads and their glutes. If that's you, you can take the same approach I advocated for heavy rows in "The 6 Grittiest Back Exercises You're Not Doing." First, do a few sets of deep, full-ROM squats. Then add in a few additional sets of squat just to parallel. Want to make those extra sets count even more? Keep your knees slightly bent at the top of each rep. This will push the time under tension on your quads through the roof! Leg complexes are high-volume, low-load protocols that involve a group of lower body exercises performed back-to-back. Ideally, all exercises within a given complex should be performed as fast as possible, with little to no rest in between exercises. However, short rest breaks are sometimes required as these protocols will have your legs tired and burning like never before! In a pinch, these could be the meat of a leg workout. Otherwise, they could serve as a finisher that you won't soon forget. So you've got bad knees and can't do most of the other quad options discussed above? You're not alone. But you're also not excused from leg day! Two of the best knee-friendly quad-builders out there are heavy sled pushes and drags, and indoor or outdoor cycling. If you have access to an Airdyne or other fan bike, even better! These aren't just good for lung-burning interval work. They can give your quads every bit of the work that you'd get from a leg workout. If you don't have access to a weight-sled, try plate pushes. These aren't just a quad killer, they're also a great conditioning method! Place a heavy weight plate—at least 35-45 pounds—on top of a towel so that it glides on the floor or a turf surface. For an additional challenge, you can also place a set of 25-35 pound dumbbells on top of the weight plate. This allows you to get into a neutral-grip push-up position with your hands on top of the weight plate. Now, just push! Drive with your legs by bringing your knees up toward your chest. Push the plate quickly across the floor up and back for a total of 40 to 50 yards. In terms of technique, these are pretty straightforward. Just be sure to keep your elbows straight and your arms at roughly a 45-degree angle above your head. Take long strides, and don't let your hips drift higher than your shoulders. Remember that front squat video workout I mentioned earlier? This is how it ended—and after three sets, there was no doubt that the workout was over. If you're looking for the perfect capper to a leg day or full-body workout, this just might be it! Farrokhi, S., Pollard, C. D., Souza, R. B., Chen, Y. J., Reischl, S., & Powers, C. M. (2008). Trunk position influences the kinematics, kinetics, and muscle activity of the lead lower extremity during the forward lunge exercise. Journal of Orthopaedic & Sports Physical Therapy, 38(7), 403-409. Gullett, J. C., Tillman, M. D., Gutierrez, G. M., & Chow, J. W. (2009). A biomechanical comparison of back and front squats in healthy trained individuals. The Journal of Strength & Conditioning Research, 23(1), 284-292. Schoenfeld, B. J. (2010). Squatting kinematics and kinetics and their application to exercise performance. The Journal of Strength & Conditioning Research, 24(12), 3497-3506. Schoenfeld, B.J. 2010. The mechanisms of muscle hypertrophy and their application to resistance training. Journal of Strength and Conditioning Research 24(10): 2857–72. Adam, A., & De Luca, C. J. (2003). Recruitment order of motor units in human vastus lateralis muscle is maintained during fatiguing contractions. Journal of Neurophysiology, 90(5), 2919-2927. Mitchell, C. J., Churchward-Venne, T. A., West, D. W., Burd, N. A., Breen, L., Baker, S. K., & Phillips, S. M. (2012). Resistance exercise load does not determine training-mediated hypertrophic gains in young men. Journal of Applied Physiology, 113(1), 71-77.